With tensions between North Korea and the US touching new highs every week, civility is becoming the biggest casualty, especially as the controversial leaders of both countries trade insults with one another (Little Rocket man vs Dotard, anyone?). 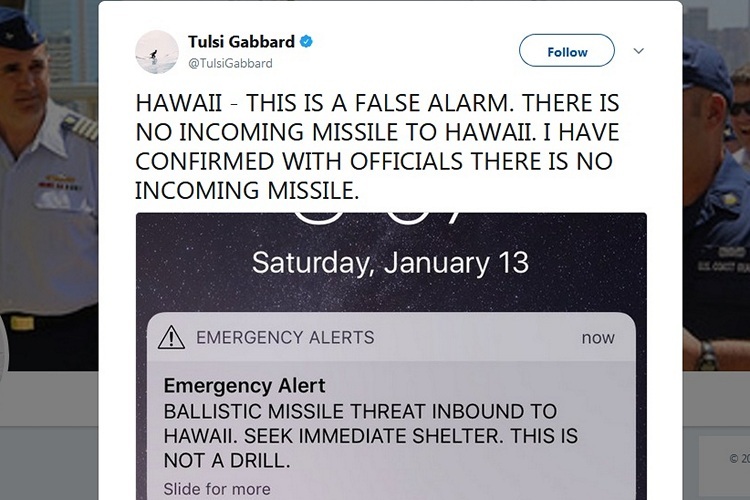 However, a curious incident this weekend just emphasized exactly how real the threat of a full-fledged military action from either side actually is, with a false, but simply terrifying alert going out to residents on the Hawaiian islands about a “ballistic missile threat”. The warning message sent by Hawaii Emergency Management Agency (HEMA) through mobiles and television, urged residents to “seek immediate shelter”, specifically stating that “this is not a drill”. While the alert was withdrawn about 38 minutes after it was first sent out, it took hours for the panic to subside, although, people in the region continued to remain in a state of confusion about the alert message with potentially deadly consequences. On its part, HEMA denied rumors that this was the work of a hacker, saying that the false alarm was the result of human error. With a view towards reviewing their warning system and making it foolproof, the agency has instituted a two-person activation / verification rule for future tests. It also suspended all upcoming drills amidst reports that the alert was indeed pushed out as part of an ongoing drill. With people wondering aloud about how the entire drama could unfold in spite of all the safeguards that are believed to have been in place, news agencies started reaching out to various government agencies in charge for their reactions. Contacted by BuzzFeed News, the Emergency Management Agency’s public information officer, Richard Rapoza, said that the agency was “trying to find where the error occurred”. According to him, the EMA still doesn’t have any clear answer about how this faux pas happened, but is “working on a number of hypotheses”. If you were one of the poor souls frightened by this message, let us know how it impacted you – albeit for a short while.